Sometimes as a musical theatre enthusiast you can’t beat the feel-good, warm-hearted, nostalgia-scented treat of classic Rodgers and Hammerstein. 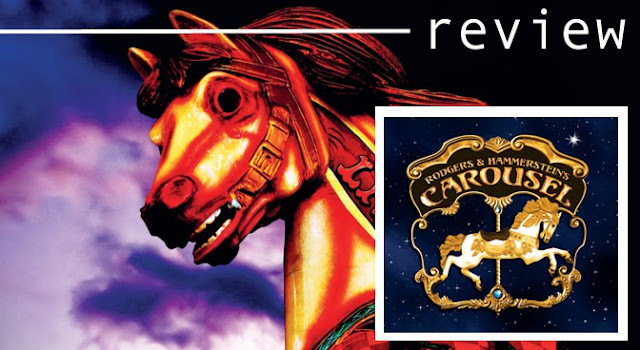 Innocuous, family-friendly, good old-fashioned entertainment with a genuine pedigree of quality and proven appeal through the ages, nowhere more amongst their back catalogue are these virtues apparent than in Carousel. A re-affirming morality tale of family, friendship and vintage romance, the buoyant love story of Julie Jordan and Billy Bigelow has once again hit the boards this week in thoroughly professional, supremely entertaining form by one of the Midlands’ most reputable and celebrated theatre troupes, the South Staffs Musical Theatre Company. No strangers to big, classic musicals, having staged the likes of Sound of Music, My Fair Lady, Oklahoma, Singing in the Rain, Oliver and The King And I in the past decade alone, their latest production continues to demonstrate the breadth and standard of talent the company attracts, with Carousel’s four leads in particular giving beautifully accomplished performances in terms of acting and vocals alike. It’s often difficult to review local company shows such as this without leaning on comparisons to West End or professional productions and the like as some form of comparative measuring rod of standards, yet South Staffs’ Carousel is one such admirable production that genuinely renders doing so pretty much redundant. In addition to the practically faultless cast, the inventive and arresting approach to set and costume design, and consistently high quality of choreography and direction all harmonise beautifully in a production which looks, sounds and very definitely feels like a wholly complete musical theatre extravaganza theatre. South Staffs’ certainly know how to put on an impressive, professional show without any sense of compromise or downscaling. Carousel itself, for those unfamiliar, follows the blossoming romance and ensuing marriage of dashing young carousel barker Billy Bigelow (Tye Harris) - a troubled, frustrated soul - and his honest to goodness sweetheart Julie Jordan (Laura Evans) as they weather a flirtatious first meeting, tempestuous marriage and ultimately tragedy. Around them the seaside community flowers with a number of charming supporting characters including the maternal cousin Nettie (Sheila Wood), Julie’s best friend Carrie Pipperidge (Rosie Harper), her somewhat oafish but entrepreneurial betrothed Enoch Snow (John Sheard) and Billy’s questionable ex-con friend Jigger Craigin (Simon Hodson). The Billy-Julie story itself is endearing in its archetypal accessibility and old-fashioned charm, though takes a slightly less conventional turn in the second Act where a great deal of the show’s heart and quintessential Rodgers and Hammerstein melodrama are given chance to shine. Narratively antiquated as it may be, there is still a great deal to enjoy and appreciate about a wholesome, classical character-centric yarn such as this, particularly when accompanied by such wonderful scoring and music as ‘If I Loved You’, ‘June is Bustin’ Out All Over’, ‘Mister Snow’ and the anthematic ‘You’ll Never Walk Alone’ (Carousel being the iconic songs’ genesis). The assembled company cast do a truly wonderful job of tackling these big, renowned numbers, again cementing the sense of watching a big, bold, professional musical theatre experience. Set pieces such as ‘June is Bustin’ Out All Over’ and ‘A Real Nice Clambake’ are vibrant, spirited and bursting with colour and scope, the comedic interplay of ‘When The Children Are Asleep’ is beautifully observed by Harper and Sheard, and the pivotal romantic hooks of ‘If I Loved You’, ‘Soliloquy’ and ‘You’ll Never Walk Alone’ are given delicacy, grace and charm by Evans, Harris and Wood respectively. This is an impressive, confident cast who mine all of the heart and joy out of a musical that is in no short supply of either. John Sheard and Rosie Harper work fantastically well together as Enoch and Carrie, bouncing off of each other with a palpable comfort and chemistry. Harper’s Carrie is a refreshingly innocent and jovial take on the role where others have often seen her as a predictable chance to play a sassier, cocksure foil to the sweetly Julie Jordan. The friendship between Carrie and Julie is here both believable and appealing, as is the aforementioned bond with John Sheard’s wonderfully charismatic Enoch. Sheard treads a masterful balance between the goofier side to the role without resorting to base caricature, and nails his big numbers with impressive clout. Tye Harris tackles the role of Billy with a sensitivity and effortlessness that lends the character shades of empathy often unseen with a bolshier, more unabashed take on the character. His naturalistic approach gives his Billy a more contemporary edge and cuts through some of the shows inherent fantasy and artifice - the conflict and frustration just feel more real. It is a performance which confidently and impressively makes the character both notably more believable and interesting, and is thankfully met in quality and impact by Laura Evans resplendent turn as Julie Jordan. Whereas Harris’ Billy feels a more instantly believable figure, Evans’ turn as Julie is so on-point as a classical Rodgers and Hammerstein female lead that she simply looks and sounds as though she has been plucked straight from the 50’s and placed on the stage to play the role. Despite the slightly different cant to the performances, which actually serves to enhance the unlikely bond and differing dispositions between Billy and Julie, both leads work beautifully together, pull off their respective accents with aplomb and demonstrate rich, beautiful vocals, tremendous stage discipline and a standard of performing that is streets ahead of most productions of this ilk. In all, Carousel proves to be another ambitious, exciting spectacle from South Staffs Musical Theatre Company and the latest in a long line of productions as such. As my initiation to the company’s productions, the level of craftsmanship, ability and artistry that have been poured into the show is evident throughout, and all involved should be incredibly proud of the standard of professionalism they have attained. Bursting with talent across all departments, the 77 year old company is in wonderful, creative shape and it is with genuine excitement and anticipation I await their next production, Lionel Bart’s Oliver! this time next year. CAROUSEL has now completed its run at the Wolverhampton Grand Theatre. For more information on South Staffs Musical Theatre Company, visit their website HERE. Press tickets for this performance of Carousel were provided courtesy of the Wolverhampton Grand Theatre directly. (A)musings Media gratefully acknowledges their generous invitation. I also bought a home theater system and it is perfect in its features.